Editor’s note: National Vocation Awareness Week, Nov. 4-10, begins today. We could think of no better way to share about our vocation to religious life as a Catholic sisters than to have a few of sisters share the stories of their lives and their lived vocations. So please enjoy these blog reflections over the course of the week. A joyful celebration of community. 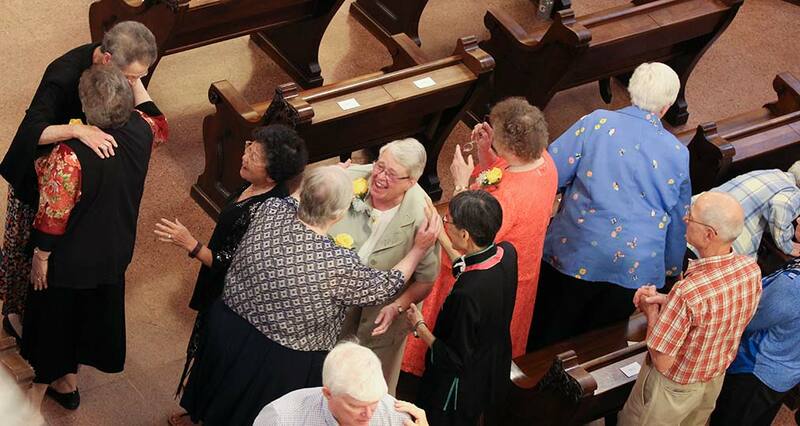 Sister Danielle Sullivan, center, greets her sisters during the sign of peace at her 50th anniversary celebration in 2017. In many ways, I have always found myself in the midst of the Sisters of Providence. My dad’s oldest sibling was Sister Esther Marie Sullivan. Dad frequently drove for the sisters, and I was his companion. On Sunday afternoons during the school year, you would find the entire Sullivan family visiting at St. Rose Convent in Chelsea, Massachusetts. While the adults would enjoy visiting in the parlor, I would be ice skating with the sisters in the enclosed yard. During the summer, we would head up to Lady Isle in Portsmouth, New Hampshire, where I was invited to play softball with some of the more athletic SPs. They were delightful! Joyful! It was great fun! I attended Cheverus School in Malden, Massachusetts, where I was taught all 12 years by the Sisters of Providence. Many examples of people living out their faith nudged me on my way. As a freshman in high school, I began attending daily Mass. I also joined the Junior Sodality, helped out with religious education classes and with other parish activities. The priest moderator for the Junior Sodality took a group of us to a house party. The Adult Sodality of men and women cell group came together each month to be nourished by prayer, reflection, discussion, conversation, as well as food. Following that party, each one or couple went out to start a new cell group. 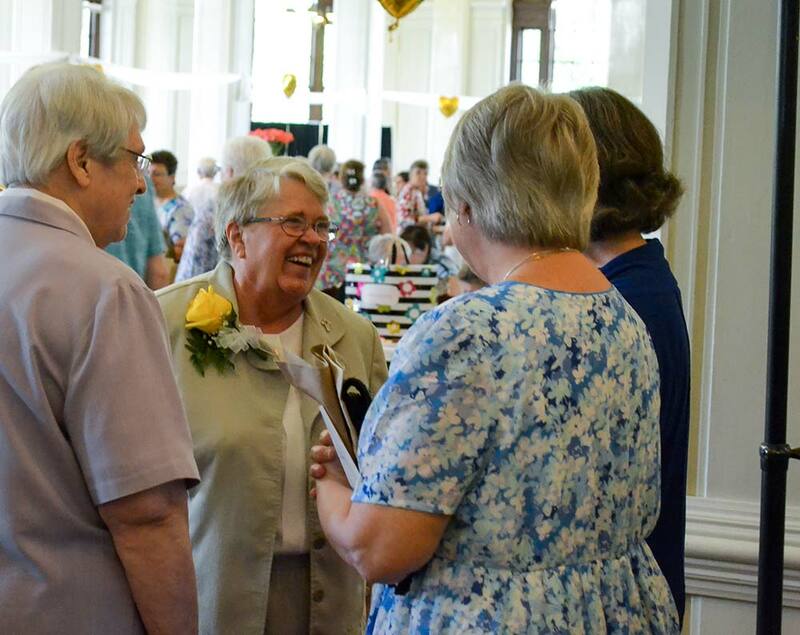 Sister Danielle Sullivan greets sisters and guests during her golden jubilee celebration in 2017. The Sisters of Providence were also models. Some of my high school friends and I would sit outside under the chapel windows and listen to the sisters chanting the office. The SPs, the folks attending daily Mass, the cell group: all created a yearning within me. I found myself wanting to know more about what they had: their relationship with our Provident God, their need for community, their desire to serve, and their JOYFULNESS! All of these folks were called and responded by living out their own vocation to religious life. My personal call led me to join an apostolic community, the Sisters of Providence. Leaving my family and friends at age 18 was a challenge! The only time I had been to Saint Mary-of-the-Woods was when I was nine years old. Now I was boarding a plane alone and not feeling very confident. We left Boston and stopped in New York. Once we were back in the air, the flight attendant came to me and asked if I was going to Saint Mary’s. When I responded yes, she said to follow her. She led me to the front of the plane where there were four young women (one from New York, two from D.C., and one from Florida). We were all heading to Saint Mary’s. The flight attendant said that over the years she noticed young women heading to Indiana about this time — all carried black umbrellas! I immediately felt part of a community, the Sisters of Providence community! I have had a variety of ministries (teacher, principal, Provincial Treasurer and Provincial Councilor, General Treasurer and General Officer). I have also served as chief financial officer for the Sisters of Notre Dame’s Boston and Ipswich provinces. I currently minister in the finance office for the Sisters of St. Joseph of Boston. My first year teaching I taught second grade at St. Ann’s in Washington, D.C. One day I was preparing the children for school liturgy. The scripture was seek, ask, and knock. One young lad stated that he was asking and asking and nothing was happening — God was NOT answering. Then Larry (my young theologian) told him, “God did answer you. God said NO – it’s not good for you right now.” Every time I hear that Scriptural passage, I pray for Larry. There are no words to express how grateful I am to be a Sister of Providence! I have been enriched not only by the gift of an education and professional opportunities, but especially by the giftedness of each member of this Congregation. I pray for all my sisters and they pray for me as we respond each and every day to the call from our Provident God by devoting ourselves to works of love, mercy and justice in service among God’s people. Sister Danielle Sullivan, SP, was born in Melrose, Massachusetts. She was taught by the Sisters of Providence at Cheverus School. Sister Danielle has several SP relatives: Sister Esther Marie Sullivan was her aunt, Sister Therese Guerin Sullivan is a cousin and Sister Betty Donoghue refers to her as an almost relative — Sister Betty’s nephew is Sister Danielle’s brother-in-law. Sister Danielle has a bachelor’s degree in education from Saint Mary-of-the-Woods College and a master’s degree in administration from the University of Notre Dame. She currently ministers in the finance office for the Sisters of St. Joseph of Boston. She celebrated 50 years as a Sister of Providence in 2017. So glad to be on this journey with you, band member! Thanks Mary Lou…I’ m happy and proud to be your band member. Thank you Danielle for sharing your story of how you came to the Sisters of Providence. Thanks, Danielle. I will never underestimate the importance of a simple black umbrella again. Such a providential moment because of a flight attendant who took the time to notice. I enjoyed reading your story. – It’s fun to try to imagine the yard at St. Rose Convent as actually being a place to ice skate.